It’s the most wonderful time of the year: Christmas season! If you are learning Spanish there are many reasons to learn Christmas vocabulary. Maybe you are traveling to a Spanish speaking country during the holidays or you’d like to read a festive book or watch a holiday movie in Spanish to get in the Christmas spirit. No matter what your reasons are, here’s the essential Spanish Christmas vocabulary to get you ready. Celebrated on the night of the 24th of December, la ‘Nochebuena‘ is a more important holiday in Spain than Christmas day. This is because the whole family gets together to have dinner on ‘Nochebuena’ and has an amazing feast which, depending on the family, could be anything from seafood, to lamb, to roast beef. ¿Qué vas a cocinar para Nochebuena? – What are you going to cook for Christmas Eve? One of the best things about the Christmas holiday season is the cheerful decorations. The most typical one is the Christmas tree, of course, which is “árbol de Navidad”. 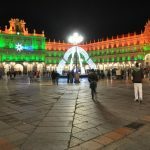 If you come to Madrid you should definitely visit Plaza Mayor and take a look at the amazing árbol de Navidad and the beautiful Christmas lights (‘luces navideñas’) that decorate it. The Belén is the artistic exhibition representing the nativity scene. In Spain you can find them in lots of public places like city hall and storefronts, and many families have one at home. This word actually makes a lot of sense! ‘Noche‘ in Spanish means night and ‘vieja‘ means old. If you put them together we are literally saying ‘old night’, Nochevieja, and we use it to talk about the 31st of December, the last day of the year. If you want to practice your vocabulary, maybe it is time for you to start asking your friends how they are going to celebrate ‘Nochevieja‘, so that you can both practice your Spanish and plan a fantastic night out. ¡Feliz Año Nuevo! – Happy New Year! Even though in every country there are different traditions when it comes to celebrating the New Year, there is one thing all Spanish speaking countries do, and that is saying ‘¡Feliz Año Nuevo!’ to their friends, family and even strangers in the street. If you are in Spain around that time, don’t hesitate to wish everyone a ‘Feliz Año Nuevo 2017′. On the 6th of January there’s another really important holiday in Spain, the ‘Three Wise Men’ or ‘Reyes Magos‘. Generally, presents are given on this day (not Christmas Day!) though this will depend on each family. The day before, there are local parades where you can see the ‘Reyes Magos‘ before the big night and the famous Madrid parade is televised. Do you know the names of the ‘Reyes Magos‘ in Spanish? That’s right! Melchor, Gaspar y Baltazar. If you have any questions or comments, don’t hesitate to leave a comment in our Facebook page or email us at hola@on-espanol.com.